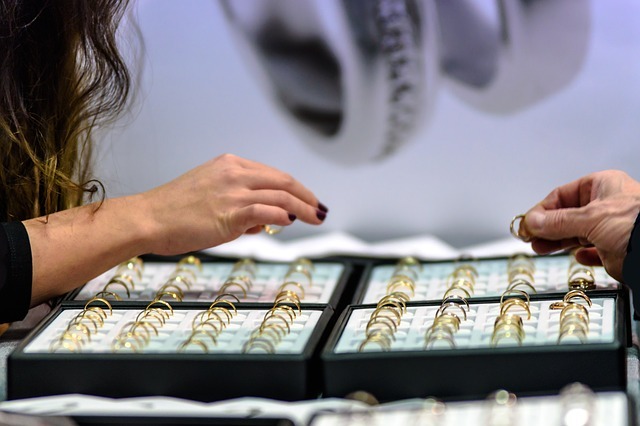 Here are three simple ways to make your customers fall in love with your jewelry business. Owning a jewelry business is not an easy task. You have to come up with creative ways to market your products to stand out from your competition. There are many competitors in this industry as well, both offline and online. One way to make sure you convert leads to conversions is by satisfying your customers. That said, here are three tips on how to make people fall in love with you and your products. When a customer comes up to a ring or necklace display, genuinely listen to what they have to say about it. Always respond in a pleasant tone and with a smile on your face. Answer their questions clearly and ask them as well. Doing so shows that you appreciate their thoughts. You can lengthen the conversation by asking for feedback on your other products or your shop as a whole. Aside from making a connection with them, your customers’ answers and suggestions can help you determine what you need to change, or what you need to do to make your business perform better. No one will want to buy from a shop with rude people running it. Once a customer gets a bad experience from you, there’s a big chance they’ll spread the word to everyone they know, which is most likely on social media. This is why you should never lose your patience with an irate customer. Address the issue calmly and with class, as well as provide a solution to their complaints. Make them feel that you value their concerns and respect their opinions as a customer. 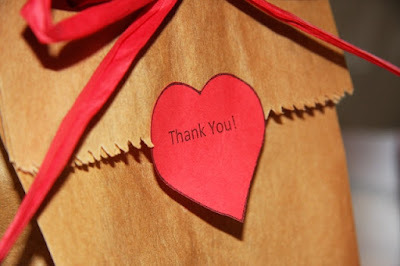 Do not just simply say, “thank you;” genuinely show them that you appreciate them as your customer. 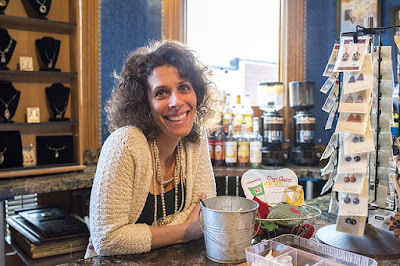 Research shows that people spend more time in a business known for positive customer experience. Being appreciative is a way to make them stay loyal to you and will pave the way for positive word-of-mouth advertising. Thanking them can be done in so many ways and not just at the after purchase phase. Send thank you emails or give back to your loyal customers by giving exclusive perks like discounts on your jewelry pieces. Champagne pink jewelry displays will help you achieve the romantic, vintage feel for your fall display. In a little more than a week, Halloween is going to come and go as quick as a witch on a broom, and it’s time to get back to fall-inspired display for your jewelry pieces. 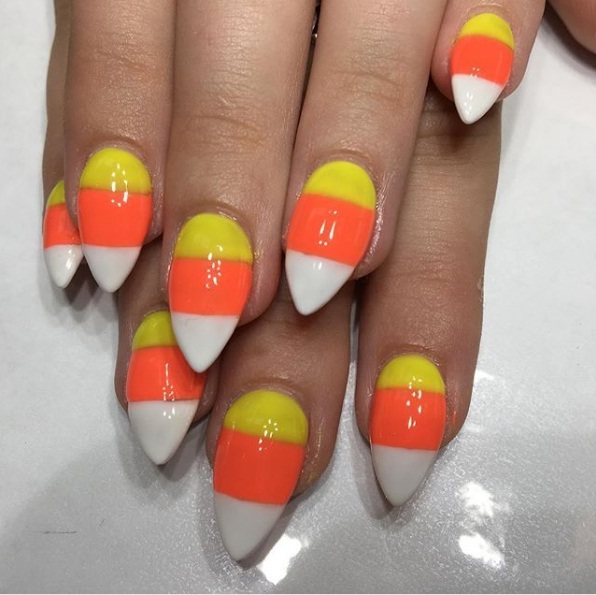 If you want to stand out from all the other jewelry shops, don’t just settle with the typical fall color palette, which only includes red, orange, brown, purple, and yellow. 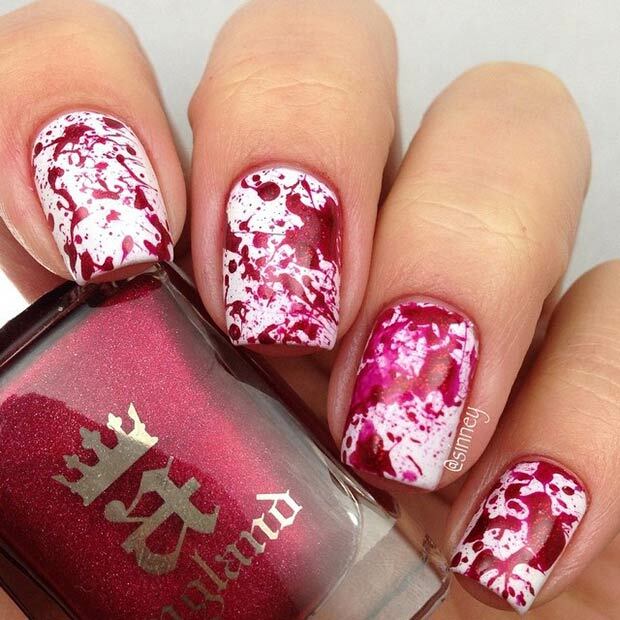 Champagne pink, for example, is a shade that looks gorgeous for this season. It’s soft, warm, a bit rustic, and gives off a light, calming feel. 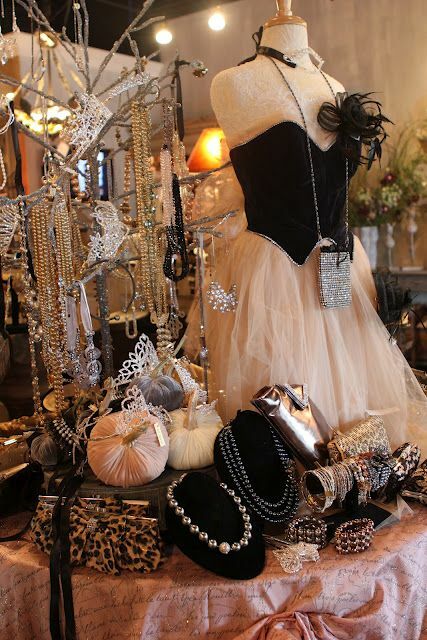 And if you want to go for a Parisian autumn look that exudes romanticism and vintage elegance, here are champagne pink jewelry displays for your shop. 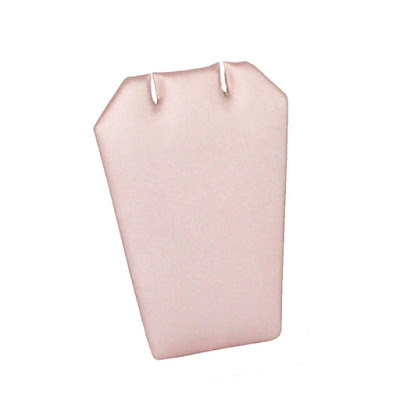 Instead of settling for earring cards hung on a plain rotating metal display, showcase your earrings on this Pink Champagne Leatherette Earring Stand. Since it can only hold one pair, it’s perfect for displaying your one-of-a-kind pieces, as well as your most expensive pairs. Hooks, drops, and chandelier earrings are the best ones to display in this earring display. 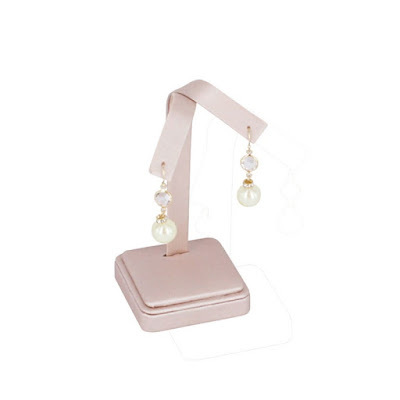 If the earring stand is too plain for your tastes, you can use the Champagne Pink Earring Tree. It can hold just one pair, so it’s ideal for showcasing drop earrings and chandelier earrings as long as three inches because the earring tree is five inches in height. 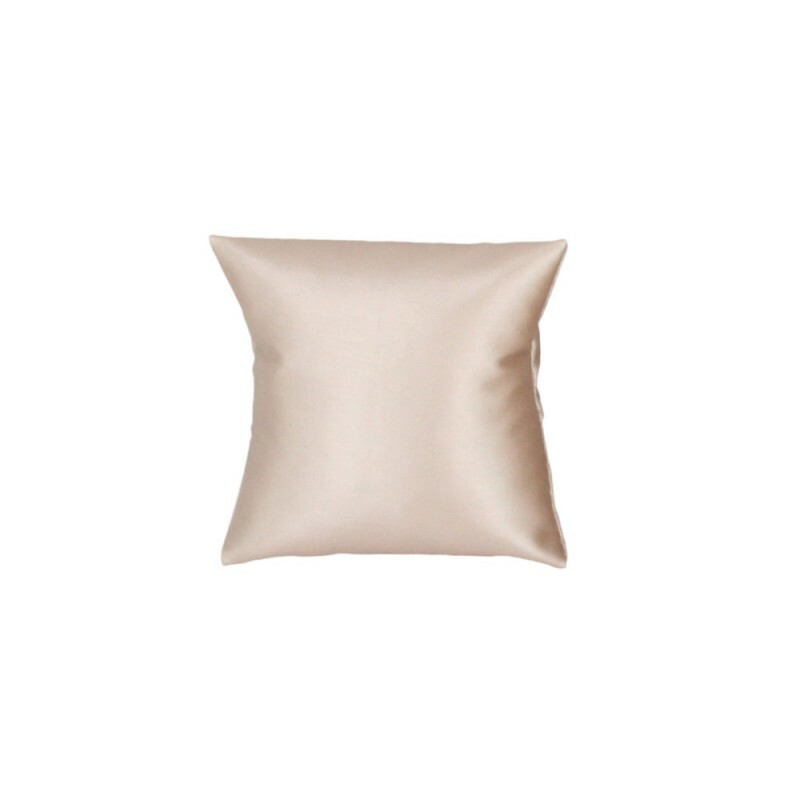 The Champagne Pink Leatherette Pillow Bracelet & Bangle Display is sure to make your bracelets stand out in the most feminine way. Silver jewelry, as well as black and gray-plated pieces as they tend to stand out more with the pink hue. This pillow display is 3 x 3 inches in size so it can hold up to three thin bracelets. Showcase your rings with this Champagne Pink Leatherette Ring Display. 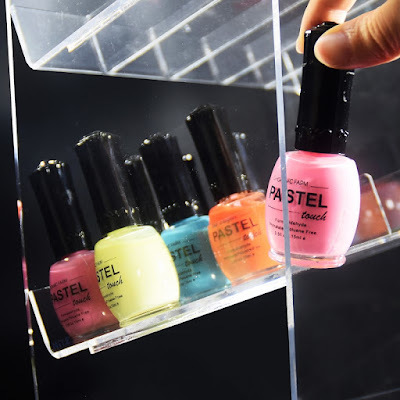 It is ideal for minimalist displays and exhibiting five rings. As with the pillow, it’s great for silver jewelry and dark-colored pieces. This display is perfect for ring sets and rings with large center stones. 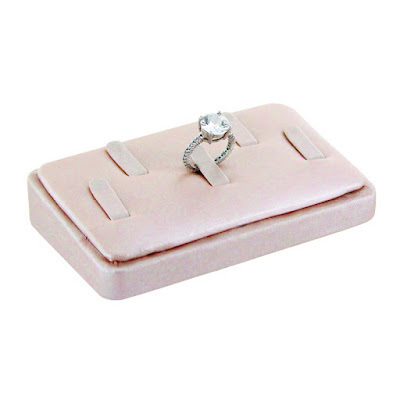 If you need to showcase a single ring, use the Champagne Pink Leatherette Ring Display. It’s perfect for exhibiting a cocktail ring or an engagement ring. As with the five-ring display, it is also great for minimalist-themed shops this fall. For a whole large jewelry set of the same design, you can use the Pink Champagne Display Sets. You can either use the nine-piece set or the 18-piece one. The nine-piece includes various displays, including a necklace display bust. The 18-piece boasts four earring stands and also two bracelet display ramps, two of which the nine-piece set does not have. Shop for these elegant displays in the online shop and discover more for your fall display. As the second part of last week’s article, we are going to highlight a few of our displays fit for Halloween. If you have no time to create your own earring or necklace display this Halloween, you can opt to buy ready-made jewelry displays. 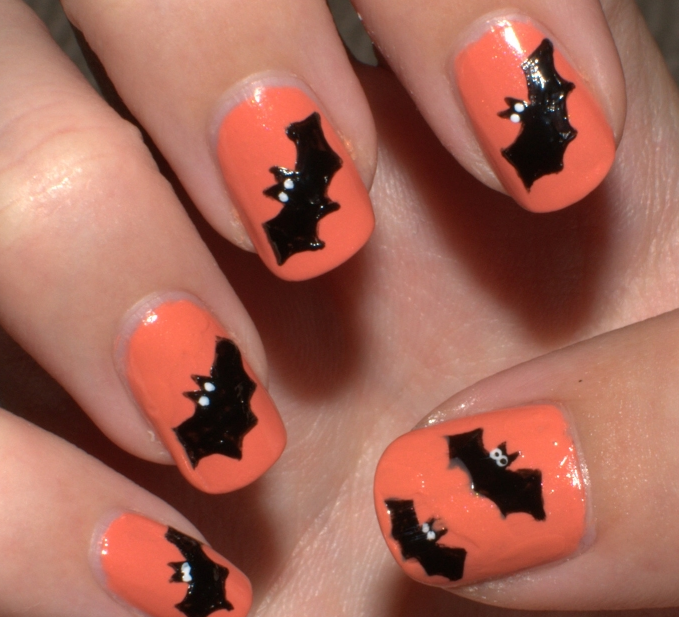 You just need to add a touch of spookiness by adding a few props such as fake cobwebs, plastic skeletons, and pumpkins. 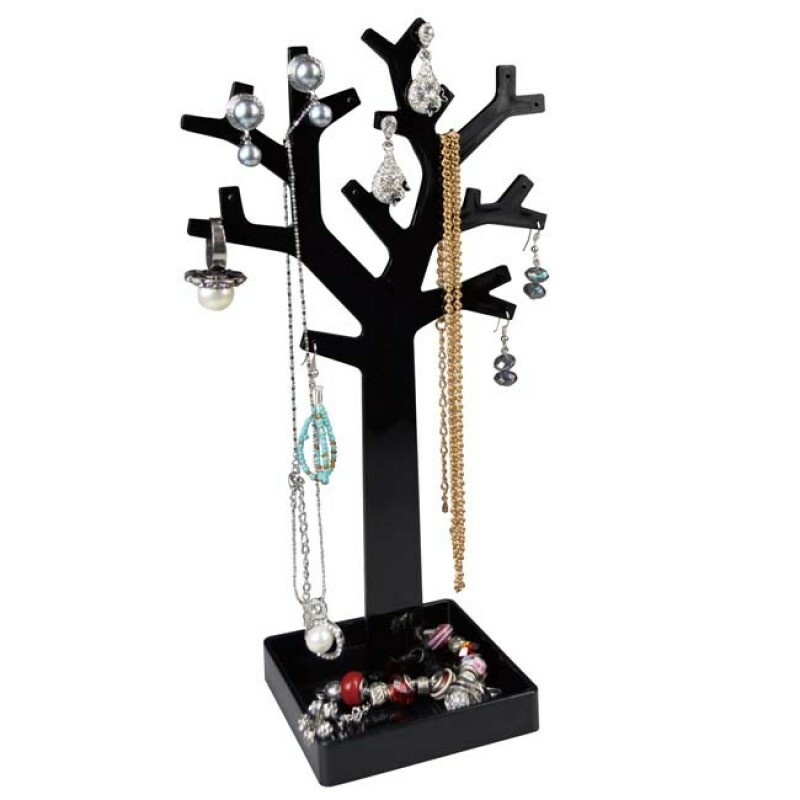 And without further ado, here are four jewelry tree stands that can effectively showcase your Halloween-inspired pieces this trick or treating season. Nothing looks spookier than a black leafless tree that looks like it came out of a cemetery scene of a horror film. The Acrylic Earring Tree Stand is a perfect jewelry display this trick or treating season. Aside from seven pairs of earrings, it can also hold necklaces and bracelets. The stand also features a bottom tray which can hold more jewelry pieces or even Halloween decors for an added spooky feel. 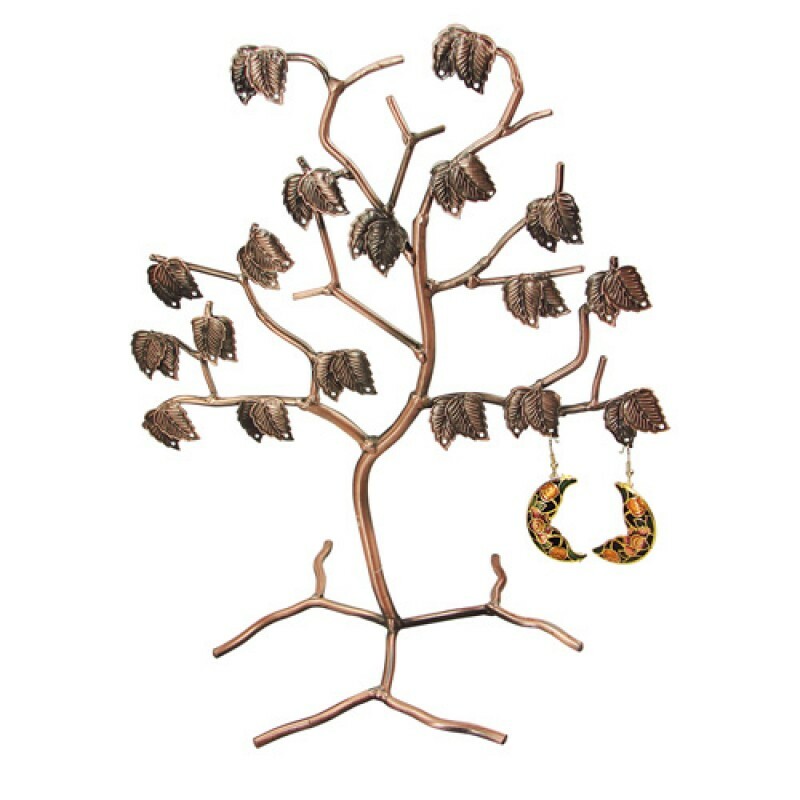 The best way to showcase pairs of earrings this season is by hanging them on the mysterious-looking Metal Earring Tree Display. It can hold up to 18 pairs and features leaves with holes to insert the hooks and posts. This display is available in two colors -- copper like the in the photo above, and pewter. Simply add Halloween decors to make it look scarier. The Metal Tree Jewelry Stand Rack is a necklace display that can give you the chills. It’s made of black metal with many branches resembling an old spooky tree. It features a gold bird on top, which you can paint black to make it look like a raven for Halloween. This stand can hold all types of jewelry, even your car keys. 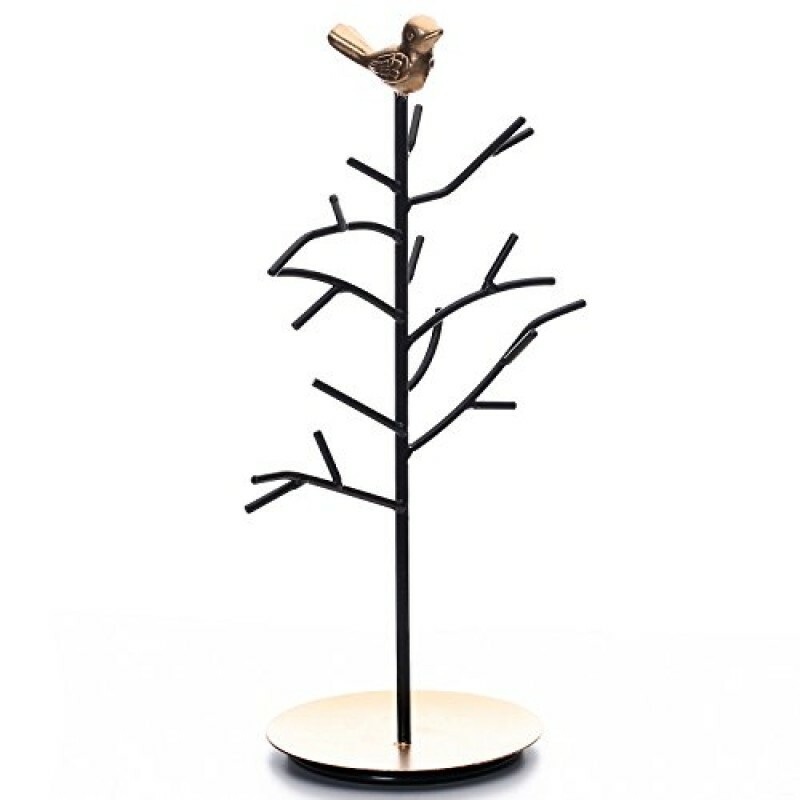 The Metal Jewelry Rack with Birds is another great addition to a Halloween display. It looks as though the rack is made of old twigs, which gives it a spooky feel. You can also hang bracelets or chokers on the two birds. 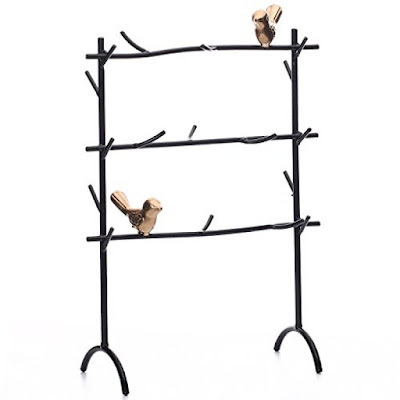 This metal rack can hold all kinds of jewelry, as well as other Halloween decorations such as plastic bats and bugs to make it look scarier. Not into tree stands? See other types of jewelry displays in the shop! 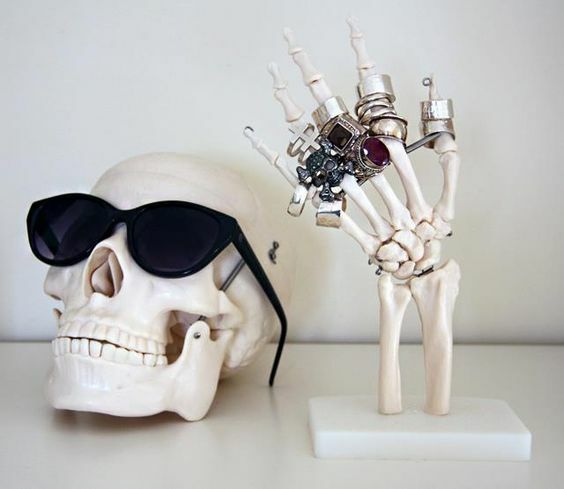 You don’t need to sell scary jewelry this trick or treating season; showcase your pieces in spooktacular jewelry displays! 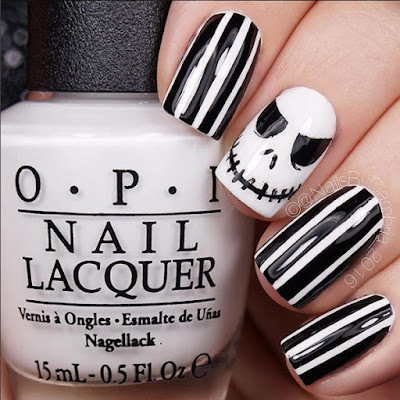 Kids are going trick or treating in three weeks time, are your Halloween displays up yet? To entice customers this spooky season, get aboard the bandwagon and set up Halloween-inspired jewelry displays. If you need ideas, fret not, us we have curated five of the best ones we’ve seen on Pinterest lately. Enjoy! 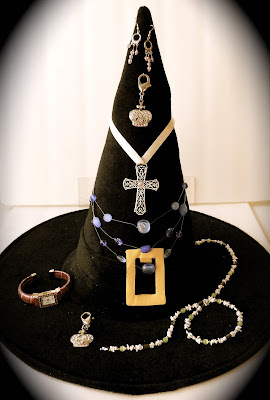 If you have old witch hats from Halloween, you can use them to showcase your jewelry for sale. If not, you can buy some from thrift shops or make them your own if you have the time and resources. These hats can hold pairs of earrings, chokers, necklace, rings, and bangles. 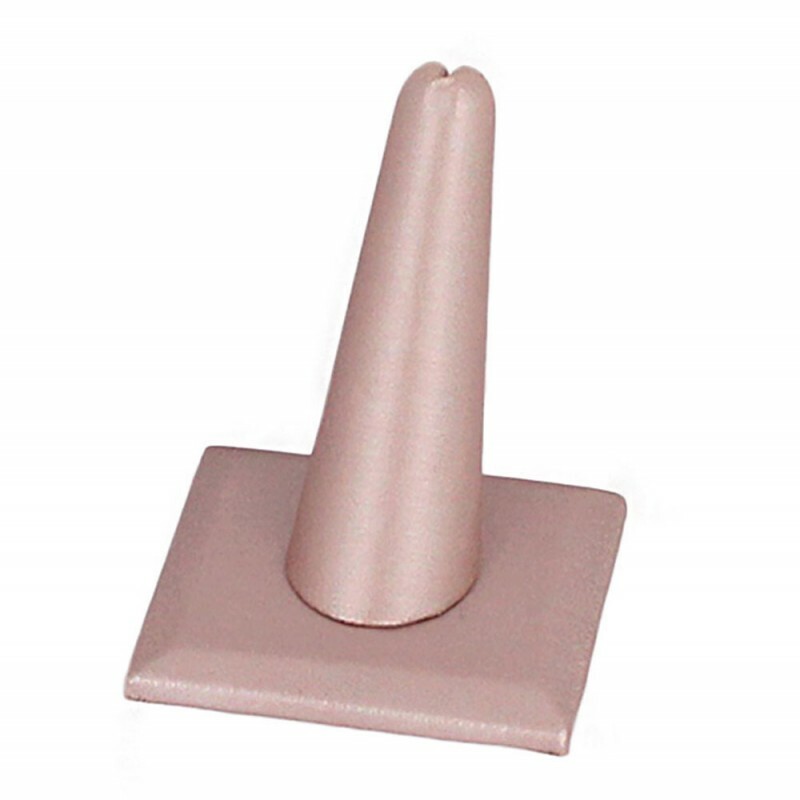 Plus, they are easy to set up, and you don’t have to disassemble them, thus, saving you a whole lot of time. The anatomical ring display can hold a whole lot of rings on each of the fingers. You don’t need to buy a real skeleton; the plastic skeleton Halloween decorations will do. It’s best if you mount it on a piece of wood, or on something sturdy. The skull is just an added charm. 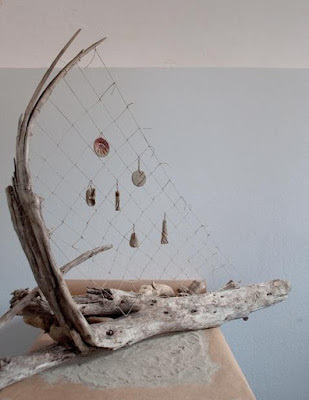 For this one, all you need is a piece of an old fishing net and an L-shaped wood. 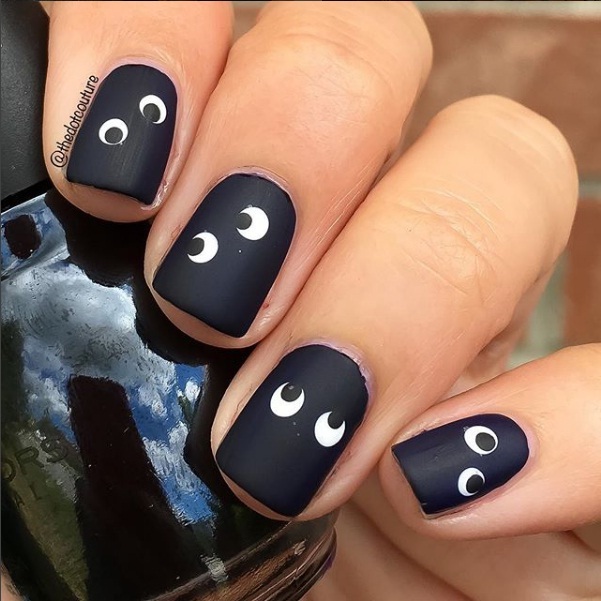 To make it look spookier, you can paint the wood black and attach some plastic spiders or bats. Although it can only hold hook earrings, you can place your other pieces at the foot of the display or the surrounding area. 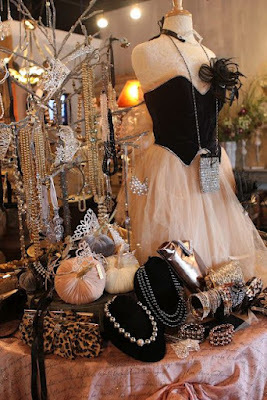 If your shop’s theme is all about vintage glamour, you can opt for this creepy doll display. 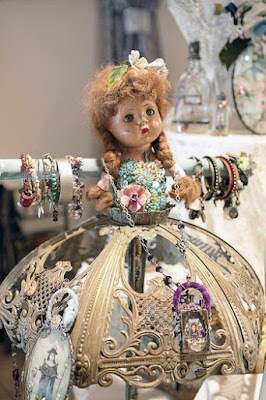 It’s not your ordinary necklace display; it has a doll head and a vintage lamp shade. It can also hold bracelets and bangles on its pipe arms. Creepy but classically beautiful. 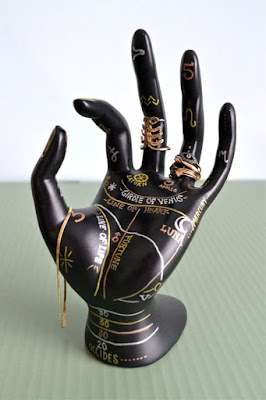 The Palmistry Ring Display is such a cool idea! You can purchase a plain black hand ring display and just paint on them using the metallic colors - bronze, silver, and gold. 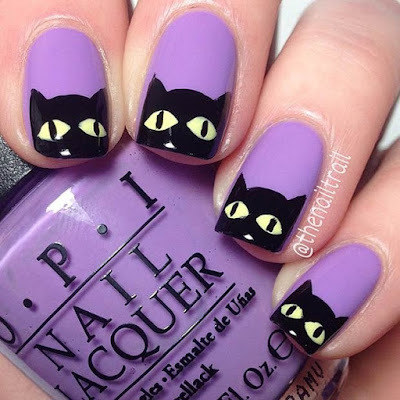 You can use the photo above as reference for the designs. This display is perfect for rings with astrological designs.